Nondestructive characterization of materials and structures contains a great possibility to organize a "safe belt" for infrastructure reliability and environment protection. Acoustic methods of nondestructive evaluation (NDE) of materials have held leading position among other NDE methods for practical applications. A lot of academic institutions and manufacturing companies are engaged in research and development of new approaches to automation and measuring: data acquisition, signal processing, dynamic imaging, computer-personnel interface, etc. However, some basic problems of acoustic measurements have been studied for a long time. The most critical of them is uncertainty of time-frequency domain resolution of ultrasonic velocity evaluation for testing of materials and structures. This uncertainty is critical for velocity evaluation of different types of surface waves: Lamb, Love, Stoneley, and some modes of leaky waves. All these types of waves (except Rayleigh waves case) are dramatically dependent on frequency domain due to their high velocity-frequency dispersion characteristics. The uncertainty of ultrasonic frequency domain is a core obstacle for application of surface waves for NDE needs. there is also uncertainty of "velocity" definition as physically we can only consider "phase" or "group" wave velocities, but for materials with high level of attenuation and dispersion these definitions do not fit. All the above-mentioned represent only a part of existing problems. Presently most ultrasonic equipment for measurements of wave velocity in construction materials uses ultrasonic pulses of high intensity for generation of ultrasonic waves. Ultrasonic velocity through material ("pitch-catch") or pulse-echo methods are applied for materials testing. The first approach has problems with changing pulse form during wave propagation from generator to receiver. The second one is more complicated as there are also reflections from flaws or the opposite edge of the specimen as well as double propagation distance and accordingly considerable changes of form and frequency spectrum of receiving pulses. In a number of papers [1, 2] such materials are considered as a low-pass filters, but this model seems to be very simplified. Some experimental works  demonstrate that such construction materials may be better represented as "comb" filters. Such a model describes spectrum as pass-in and pass-off gates for propagating pulse. As a result parts of initially generated pulses are dropped out, and phase spectrum also suffers some transformations. These effects lead to impossibility of describing velocity dispersion characteristic as a monotonically changing dispersion function. It may physically explain why the fastest components of the propagating wave are not necessarily the highest frequency components of the pulses. Applications of Lamb waves in thin plates require accurate identification of the wave mode, which is connected with frequencies of propagating pulses. Two kinds of dispersion are observed here. Dispersion connected with high wave attenuation and physical dispersion of Lamb waves, which together give additional uncertainty of ultrasonic velocities estimation. Applications of Love waves meet similar problems connected with thickness of coating layer of materials. Errors of velocity estimations do not allow to use them effectively for testing of coating quality. different types of leaky waves loose their energy faster than other types of surface waves and have high attenuation leading to the same problems. The problem of measurements of wave velocities is still open for most of construction materials because of great attenuation of pulses and due to the fact that "velocity" definition for them does not fully correspond to physical-acoustical definition of the phenomena. However, many authors continue to use measured values of pulse velocity for calculations of many physical properties of materials such as modulae of elasticity, plasticity, porosity, strength, etc. [4, 5]. Application of the discrimination method for measurements of pulse arrival time is based on threshold trigger switching when amplitude of the arriving pulse is higher than the threshold level. As the arriving wave is represented by quasi-periodical signal then loss of the fastest components of the signal may occur due to high attenuation of pulses or their level may be lower than the threshold level (Figure 1). Fig 1: Loss of the fastest components of the signal due to high attenuation of pulses, when their level is lower than the threshold level ( TH ). The other situation when the threshold is fixed for negative level may lead to loss of the positive phase of the arriving wave (Figure 2). Presence of noise makes this problem even more serious because the threshold level has to be elevated (Figure 3). where Am - amplitude of m frequency mode; fm - frequency; jm - phase component; H ( t)- Hankel function; and dm- decrement of attenuation. This work is an attempt to underline some problems, which have been on the way of the progress of ultrasonic testing of materials and structures for a long time. Presently different composite and inhomogeneous materials are used as construction materials. Their structures differ considerably from other traditional homogeneous materials, such as metals, and accordingly their ultrasonic testing is bringing new problems that require solutions. High attenuation of pulses and wave velocity dispersion are among them. On the other hand, application of different types of surface waves require accurate analysis of spectral composion of received ultrasonic pulses as well as a correct registration of time of the first wave arrival. 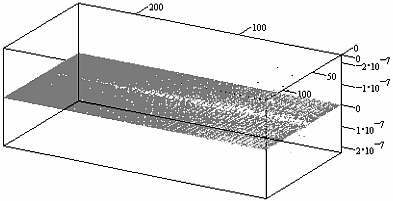 These problems have to be discussed and ways to solve the uncertainty of time-frequency domain resolution for ultrasonic velocity evaluations have to be found for further progress in the NDE testing of construction materials. Nesvijski, E.G. On Optimal Design of Ultrasonic Measuring Instruments for Estimation of Strength and Elastic Properties of Composite Materials. Proceedings: Tenth International Conference on Composite Materials (ICCM-10), Whistler, Canada, August 13-18, 1995, pp. 469-477.. Working Group Report on Nondestructive Evaluation of Concrete Structures and Materials. Third Conference on Nondestructive Evaluation of Civil Structures and Materials, Boulder, CO, USA, September 9-11, 1996, Working Group Reports, pp. 1-5. Shah S.P., Subramaniam, K.V., and Popovics, J.S. Use of Nondestructive Techniques for Material Assessment and In-Service Monitoring of Concrete Structures. Proceedings: International Symposium on Nondestructive Testing Contribution to the Infrastructure Safety Systems in the 21st Century (NDTISS'99), Torres, RS, Brazil, November 22-26, 1999, pp. 107-114. Vijay K. Madisetti, Douglas B. Williams. The Digital Signal Processing Handbook, A CRC Press & IEEE Press, 1998.